Are you broke or probably stranded? Do you need cash urgently and can afford to borrow quick cash? MTN has released a new feature called MTN XtraCash which will allow you borrow real money and some time to payback. MTN aleeady has the feature that allows you borrow airtime but this new feature is new and better than it. There are some circumstances you might find your self that you are forced to borrow real money and therefore, MTN has finally provided you with the opportunity to take care of that urgent financial need. So, this new Value Added Service called MTN XtraCash that has been added to MTN online scheme for customers to borrow cash, is based on eligibility in order to restrict some bad users and actors from misusing the service. However, the eligibility isn’t strict; just be an active MTN user and you are done. How Do I apply for MTN XtraCash services? You can borrow from N5,000 to N10,000 based on eligibility. Then, dial *606# and choose “XtraCash” option. In the next stage, you will be asked to open a Diamond Yello account by dialling *710#or if you already have, you can proceed to select the amount of cash you wish to borrow or loan and your Diamond MTN Yello account would be credited instantly. Note that: MTN XtraCash cash loan maturity period is 30 days at an interest rate of 15%. So, you can start to loan and borrow real cash from MTN with MTN XtraCash service. Airtel started this same service last year. *554*561# is the code to subscribe on airtel. 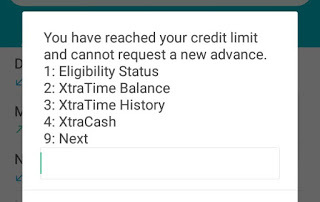 As a 1st timer and if you are eligible, i don't think u can get more than N1500 loan and also your phone number must be fully registered on the telecommunications network. Kwikcash limited it the company running it both for mtn and airtel.